A Brief History of the Fiat Ducato HYMER Car 3 Camper Van | Camperissimo! schön von Dir zu lesen. Noch mehr, dass Euch meine bescheidenen Schreibereien dazu verleitet haben, selbiges zu machen. Und dann auch noch mit dem gleichen Wohnmobil… sehr schön! Leider bin ich bisher noch nicht dazu gekommen, eine “wirkliche” Wohnmobiltour zu machen. Meine Fahrten beschränken sich meistens auf einige Tage im 400km Umkreis. Aber ich bin schon gespannt, wie Eure April Tour und der entsprechende Bericht dazu ausfallen wird. Der vom letzten Jahr liest sich sehr gut. Ich wünsche Euch weiterhin viel Spaß dabei. I love this blog post. I’ve got myself a Fiat Ducato Passenger and would love to do something similar. Are you planning to fit out the van yourself, or is it already converted? At the moment this is just a pipe-dream. But I think it’d prefer to do it myself and make it really kitsch, I’ll let you know when I make a start! Hi, my name’s Abraham from València in Spain. We’re delighted to know that someone else shares our passion for travelling and the same camper van. We’ve just bought a similar one, ours is grey, though. We take part in camper vans online forum down here and someone sent us your url. I’ve cheked all your posts out,you’ve great job. We’ve just started with our little “elephant”, we really liked the solar panel stuff. We can’t wait to sort things out and start flying!!! Wow, this is an amazing camper van, it has all the features needed for a nice and comfortable trip with the family. I do own a Fiat Ducato, but I would love to add to it all the extra features. I own such a fine hymer car 3 too! Can I send a picture of mine? Great to hear from you, Martin. We’d love to see some photos and if possible hear a little about your experiences too! How long have you had the van, and where have you travelled so far? Hello I wonder if you still check in here. I’m refurbishing a 1993 Fiat Ducato Hymercar Family just like the one that you used to own. from photographs I’ve managed to get something quite like the original but the roof bed is missing. I can’t find any photos of how this was fitted. there are two bolts fitted in both sides of the roof and a large plastic plate which looks like it might have had some sort of pole fixed in it. I could just make something that would work but I’m trying to get close to the original. You don’t have any pictures still of the roof bed in your old van by any chance? Hi there Tony, I have millions of photos taken inside the van, I’ll see what I can find and send you an email – Jay. The German company HYMER, which is based in Bad Waldsee in the southwest of the country, have been building and converting camper vans since 1961. They first became well-known in 1971 for the HYMERmobil, which was their first series production camper. 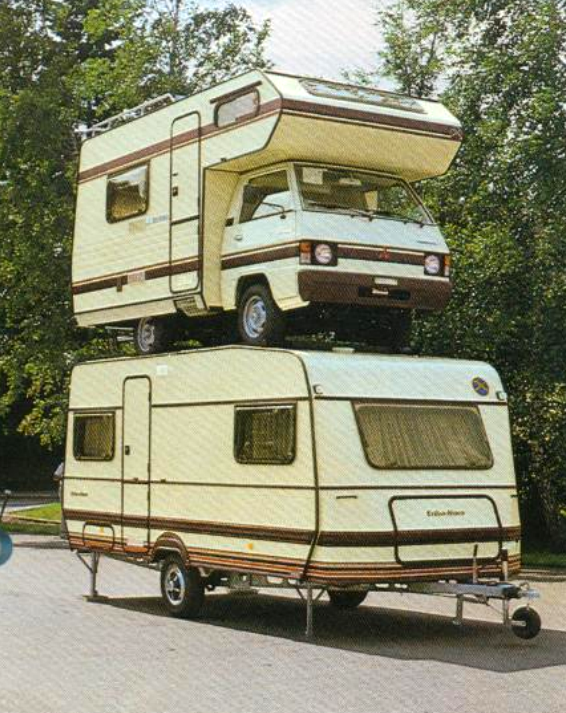 The first HYMER Car was built in 1983, based on a Ford chassis. Three years later, in 1986 Hymer began producing this model based on the Fiat Ducato van. 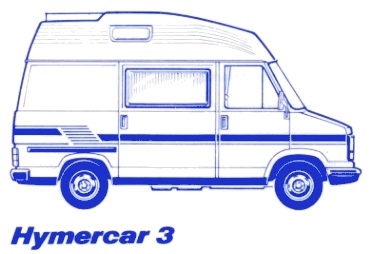 Our specific van – the HYMER Car 3 – was first detailed in their 1987 brochure (ZIP). In the days before Photoshop, this sort of stunt was the only way. Our camper van (a.k.a. camperissimo) was built in 1989 and first driven in 1990. 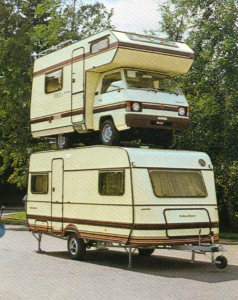 As it happens, at the time it was actually the luxury version of the HYMER Car, with its massive 2500ccm engine delivering a staggering 75 bhp of pure diesel power, along with a fair few of the optional extras: bike rack, solar panel, swivelling passenger chair and very substantial gas heating. This model was listed for the next 4-5 years, with the version illustrated in the 1992 catalogue (PDF) the most similar to our van. In 2007 the HYMER car was relaunched on the basis of the newest version of the Fiat Ducato. While the basic layout of the van remained the same, it clearly belongs to a completely different generation of camper vans. Here’s the brochure for the 2007 relaunch. The van sleeps four adults, with a fold-down double bed in the roof of the van and a piece-together jigsaw puzzle bed directly below, in the area which is usually the table. The passenger seat swivels to face the communal area and create a greater feeling of space, but the driver’s seat is fixed. Curtains on either side can be pulled around the frontal area over the dashboard. The van has room for two 6kg gas bottles, which power the stove, the heating and the fridge. The fridge can also run on mains electricity (if the mains is connected), or else off the battery if the motor is running. The van originally came with two 16 litre fresh water canisters (we now carry 60 litres: 2 x 19 litre and 2 x 16 litre) and has a 50 litre waste water tank below the car. The van has two sinks: one in the front section for cooking and dishes, another in the rear for bathroom-type activities. A solar panel is mounted on the roof for topping up the second battery. The van was sold with a PortaPottie chemical toilet, although we have never used ours. No shower is fitted, but the tap on the rear sink is a “Japanese shower” which can be pulled out of the sink for showering behind the van (we invested in a plastic basin which allows us to shower easily in the back of the van, with the doors closed). Here’s a list of stuff that we’ve changed since buying the van. I found out all of this – and a lot more besides – through a Google image search for the name of the van. I found quite a few online auctions for similar models, a great archive of HYMER product catalogues (hence the plentiful links) and a similar blog in German, which is what inspired us to finally getting around to writing one ourselves. This entry was posted in Fiat Ducato, HYMER Car 3 Camper Van and tagged Design, Fiat, Geeky, History, HYMER. Bookmark the permalink.